Have you ever heard of Koufonisia islands in Greece? Well, let’s say you definitely should! Because Koufonisia, together with the rest Small Cyclades islands are hidden treasures worth to be explored. But more on that later! For now, let’s move straight to some geographical information! Small Cyclades is a complex of a few larger and numerous smaller islands. It lies in the eastern part of the Aegean Sea, between the southern part of Naxos and the northern part of Amorgos. The most prominent islands include Donousa, Schinoussa, Koufonisia, Iraklia and Keros. While, some smaller ones are Argilos, Avelonisia, Plaki, Makares and Skandia. 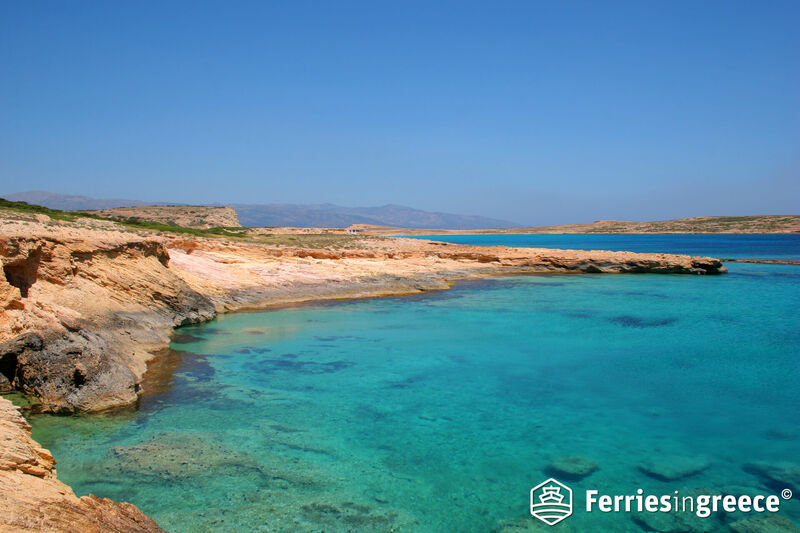 There are many ferry connections between Small Cyclades islands. This means that you have the chance to explore more islands in once (aka island hopping)! So, what’s special about Small Cyclades? Small Cyclades are famous for their lengthy, amazing sandy beaches. But, what truly makes the difference is that they are protected from the usual strong winds of Cyclades islands. That’s why they are preferred as natural harbors for sailing boats! Their untouched beauty and the breathtaking, rocky Cycladic landscape create a captivating environment! This stunning scenery allures tourists who prefer relaxing moments away from the noisy crowd. So far so good! But what makes Koufonisia and the rest of Small Cyclades islands such a dreamy world to explore? Searching for the perfect island destination for total relaxation? 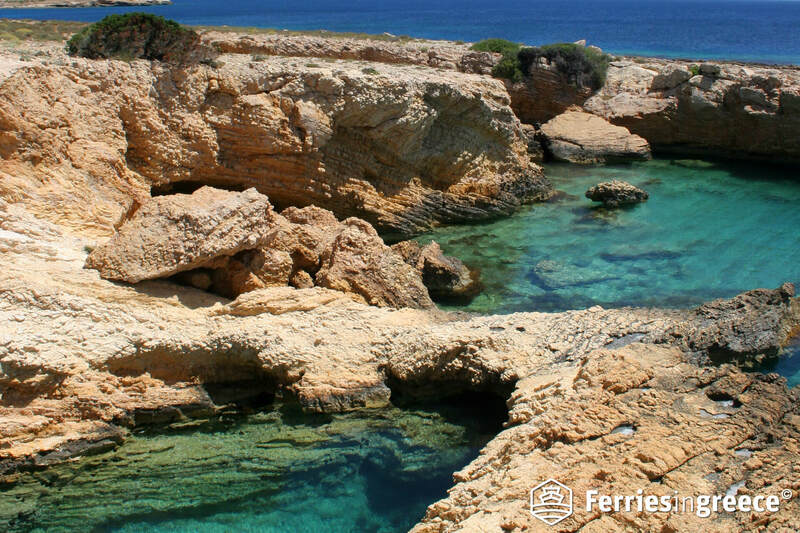 Stop now and book your ferry tickets to Koufonisia! 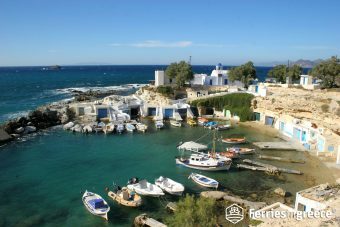 The most famous islands of Small Cyclades are Koufonisia. And truth is, they are pure heaven for both fun and relaxing holidays. 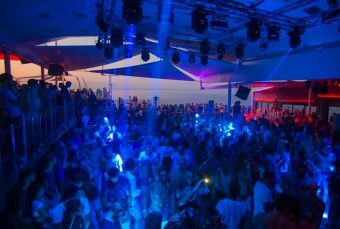 Koufonisia have been transformed into a top alternative holiday destination during the last years. During August the islands get crowded with tourists. But otherwise, they are completely isolated. Their loyal fans love not only their amazing crystal-clear waters, but also their picturesque fishing villages! The paths in the south part are ideal for hiking and exploring hidden natural beauties. The most famous beaches include Foinikas, Pori, Pisina (the Greek name for pool, due its turquoise waters), Punta and Italida (preferred mostly by nudists). As you may have already noticed, Koufonisia is actually an island complex. It consistists of two separate islands: Ano (Upper) and Kato (Down) Koufonisi. Kato Koufonissi has very few inhabitants. Its port is primarily anchored by fishing and tourist boats! If you haven’t your own boat, you can always get there by ferry. Kato Koufonissi is really close to Ano Koufonissi, Keros, Schinoussa and Naxos. This means that it is the perfect destination for an excursion! Needless to say, there are plenty of unspoiled, paradise-like beaches that will amaze you. As a result, it is the perfect place for all those who want to relax and become one with nature. Tip: Kato Koufonissi is one of the best places to camp in Greece. Ano Koufonissi is more densely populated than Kato Koufonissi. Chora is the main village of the island! And it is one of the cutest things you’ve ever seen. Chora is built according to the Cycladic architecture, which is based on simplicity and tradition. Stroll around Chora and let yourself get lost inside its labyrinth-like, cobblestone alleys, surrounded by the traditional Cycladic white houses with blue windows. Tip: A perfect way to explore Ano Koufonissi is to rent a bike! Apart from renting a bike, you can also try some surfing! Pori beach and Platia beach are the best places for windsurfing. But wait, there’s more! Trekking is also a good way to discover all the treasures that this small island hides. Wondering what is the best thing to see, when in Ano Koufonisi? Near Pori beach, there is a place where steep rocks form caves. Inside those caves you can have the best swim of your entire life! To visit those caves, you can simply take a boat to them. Trust us, you’ll be glad you did! Moreover, if you’re lucky enough to be in Ano Koufonissi on August 15th, you should attend the feast of Panagia (a religious feast dedicated to the Mother of Christ). This is the main event of the island. People use their boats to go to Kato Koufonissi in order to gather at the astonishingly beautiful Panagia church. Afterwards, they celebrate wholeheartedly. Koufonisia islands are well connected by ferry to other Cycladic islands. 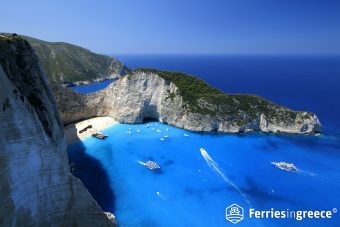 Ferries to Koufonisia depart 3 times per week from Piraeus, the main port of Athens. Also, they depart 6 days per week from the nearby islands of Naxos and Amorgos. Welcome to the absolute natural beauty paradise! With exotic waters, private bays, Donoussa has a simplicity that will captivate you. Are you ready for a quick stroll around the island? Get lost in the path that connects Stavros beach with the magnificent beach of Kedros. Now, this is important! At Kedros beach free camping is allowed. What’s more, the main village of the island provides nice accommodation, traditional taverns and cafeterias. If you are looking for privacy, we bet you’ll enjoy a perfect day at the large secluded beaches of Donoussa! The bay of Kalotaritissa with its bright blue waters is wonderful! While, Limenari beach is suitable for those who desire their own privacy, as it is only accessible by the sea. Donoussa is ideal for fishing lovers -or at least the ones who love eating them! 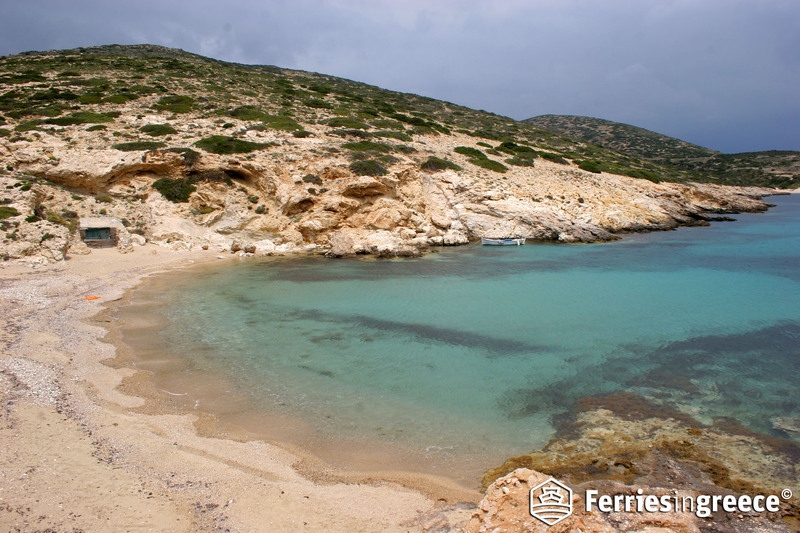 Tip: Hop on Skopelitis Ferry to Small Cyclades islands from Naxos and Amorgos. 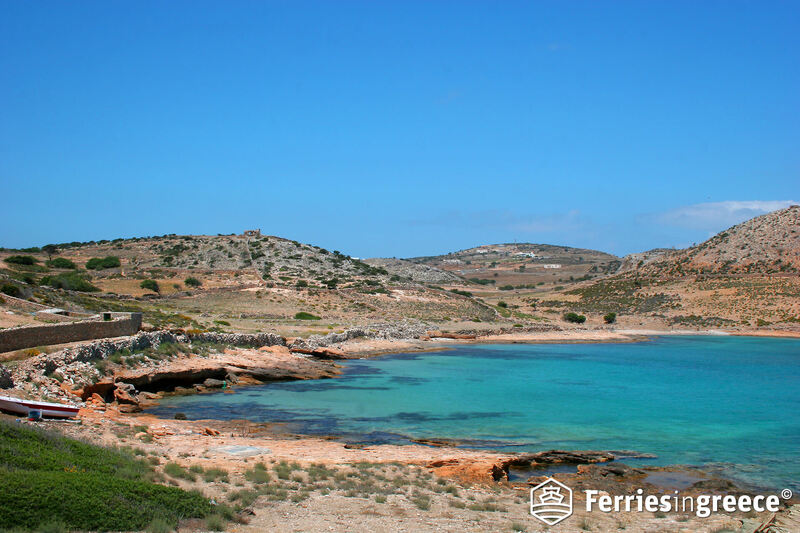 There are ferry schedules 6 days per week all year round to visit the magnificent small island of Donoussa. 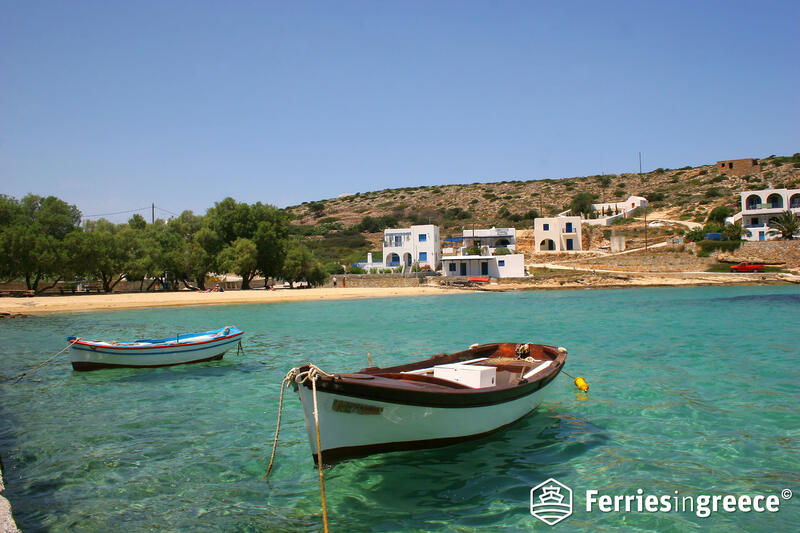 Ferries from Donoussa also travel to nearby islands such as Astypalea, Paros, Syros and more. Just imagine this. Large secluded bays and wild landscapes with exotic trees stretching throughout the island, making up the most beautiful setting for peaceful holidays. Like the rest of Small Cyclades islands, Schinoussa offers a wide range of beaches. 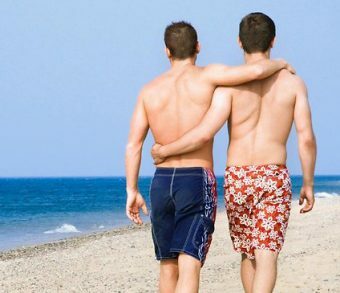 Its beaches are matching all tastes. The cosmopolitan Tsigkouri, the incomparable Gerolimnionas, the small and quiet Fontana, the three small bays of Aligaria, Gkagkavi and Kampos and so many others, waiting to be discovered. Are you a hiking lover? Follow the 2-hour hiking trail that goes around Schinoussa. It passes by secluded golden beaches, such as Almyro and Psili Ammos. For the lovers of windsurfing, a visit to Almyro beach is a must. Wondering how you can get to Schinoussa? 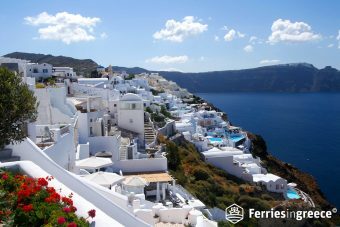 Ferries to Schinoussa depart from the port of Piraeus in Athens and neighboring islands of Cyclades. Tip: During your stay at Schinoussa, don’t miss to visit the amazing seafood taverns you’ll find at its three small villages. 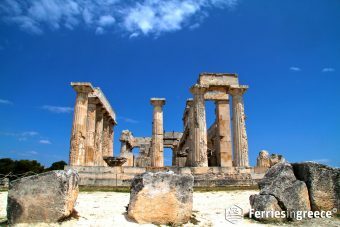 Then, you will fall in love with Iraklia! Iraklia is mostly preferred by younger ages and has a virgin natural landscape of glimmering sandy beaches. It has only one 4 kilometers road. So, the only way to admire its beauty is by walking it! 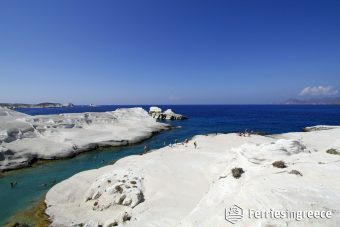 Walking around Iraklia island will lead you to charming bays, wondrous caves and sandy beaches. One thing is for sure. They will leave you in awe with their natural beauty! Wondering what the best beaches of Iraklia are? Livadi beach and Agios Georgios beach are ideal for swimming and relaxing. This is because other beaches are difficult to reach. Also, do not miss the amazing view from the sharp cliffs of Mericha, as well as the sunken WW2 plane in the bottom of Alimia. 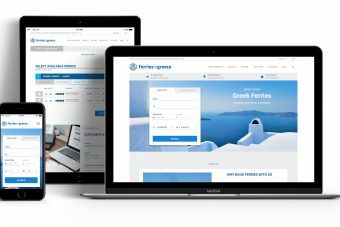 You can easily access Iraklia by ferry! Ferries to Iraklia depart from Piraeus port in Athens three times per week. 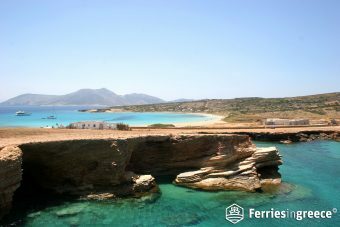 What’s more, a ferry to Small Cyclades can bring you to the impressive coasts of Iraklia, in just a couple of hours from Naxos and Amorgos. Spending your holidays to Koufonisia and the other islands of Small Cyclades might be your next dream coming true.